Syria was the original source for The Darkness Visible series. 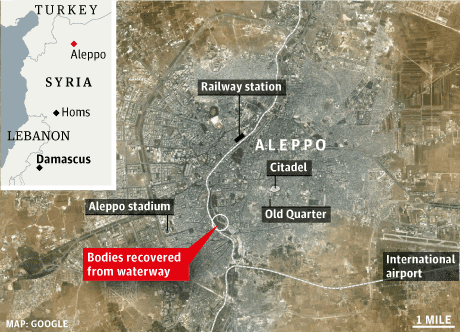 The horrific massacres that marked the outbreak of "civil war" in Syria inspired a seemingly endless focus on the tragedy. At times I have been unable to think of anything else but Syria and how easily it could be ended. Knowing what was happening due to Assad's insanity was making me question my own. Today Syria calls out to the world once more. When Houla broke last May the world couldn't help but stare with their mouths hung open. Among the 108 dead were 49 children and babies. Many of the children had had their throats slit and or shot at point-blank range. This was the worse atrocity in the civil war up to that point. The UN has finally accepted the fact that the Shabiha (an Alawite death squad) had been the murderers in Houla. This was a claim that human rights organizations had backed from the start. It was obvious that Assad was paying this minority sect of Islam, Assad's own sect, to commit bouts of ethnic cleansing across Syria. 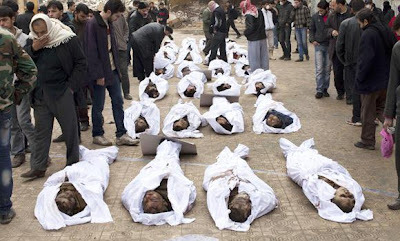 The Houla massacre was just one of the many atrocities that became the hallmarks of Assad's genocidal campaign. This latest massacre is just one more grotesque display of Assad's dedication to the destruction of Syria. 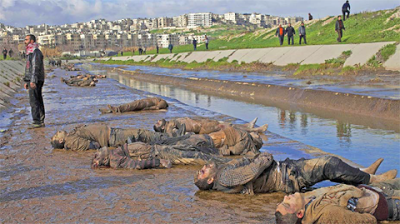 It is obvious by the trademarks of this massacre that the Shabiha were most likely responsible for the slaughter. Key points, such as hands being bound and signs of torture, point to the brutal mob and the support of the Syrian army. "With every day, with every week, with every month, the chances of him surviving are becoming less and less," Russian Prime Minister Dimitri Medvedev. As for the Russians and Chinese, their support for Syrian president Bashar Assad remains in tact. Instead of focusing on the innocent civilians the Russians continue to focus on their desire to keep Assad in power. This dedication is born out of a desire to keep rather lucrative arms sales up and running and their control of the region alongside Iran. For the Chinese their allegiance is born out of both arms sales and the promise of cheap oil and the backing of their exploitation of Africa. "... the tragedy does not have an end." Lakhdar Brahimi while speaking to the UN. Around 70 young men were pulled from the Kuwait River near Aleppo. The people in the area who had missing relatives came to identify the dead as best as they could. However with the victims having been bound and shot in the head or face, identification was difficult. The fact that all of the victims were male was impossible to miss. And the fact that the youngest victim was 12 years of age was even more difficult to overlook. This was a war crime at best. And given that the victims will most likely all be Sunni and not Shia (or Alawite) this is possibly a case of genocide. After all, Assad's goal and the goal of his family since they took power has been to sustain control over the majority of Syria's Sunni Muslims. This goal has required countless infringements upon even the most basic of human rights in the past. It now requires that Assad kill any and all those who oppose his heartless rule. The question that arises from this struggle between the two basic sects of Islam is that of whether the outside world can label this as genocide. Is it possible for two competing views of the same faith to engage in genocide against one another? Or will we now need to rewrite the definition of genocide to better fit the internal struggle Islam faces today and has faced for hundreds of years? It is the humble opinion of Alder's Ledge that genocide occurs when any group (especially a modern state) engages in acts that are meant to destroy or diminish a given targeted community. The targeted community is most often defined by a given faith, ethnicity, creed, or distinguishable social class such as those given in the caste system of India. The term genocide thus becomes imperative when the attacks are shown to be targeted at either driving the targeted community out of an area, decrease their presence in the area, or ultimately annihilate the community all together. Assad's actions show that he is operating off a "burnt earth" policy. Reprisals committed against the civilian population, though common in war, in the case of Assad are blatantly targeted at his religious competitors. More importantly there remains the fact that Assad has gone out of his way to raise his own religious group up in social standings while deliberately crushing outsiders and targeting those from directly opposing religious groups. For these reasons Alder's Ledge believes that this latest massacre is just one more display of a brutal genocide being carried out by a dictator we have often referred to as the "Nero of Damascus". And as we have stated time and time again it is the duty of the civilized world to step in and put an end to this crisis immediately. We can not wait till the tragedy plays itself out while we talk about polite policy as it relates to "national sovereignty". The wanton murder of one's own citizens must not be treated any differently than it would be if Assad's actions crossed the border over into Turkey or Israel. It is time that Assad be stopped and the cease fire be enforced with more than blue hat smurfs that run away the moment they are shot at.